Besides John 3:16, Jeremiah 29:11 is probably one of the most known and quoted verses of Scripture. It says, “‘For I know the plans I have for you,’ declares the Lord, ‘Plans to prosper you and not to harm you, plans to give you hope & a future. '” This was Mom’s favorite verse. Every time I hear it, I can’t help but think about her. Today, I kinda wanna dig into this verse a bit, because sadly, this verse is probably taken out of context when it’s quoted. So, no, this verse does not say that everything in our lives is going to be absolutely wonderful 100% of the time. Maybe just like the people of Judah, part of God’s good plan for you is to experience a time of trial. I know that part of God’s good plans for my family and me included these times of trail. During that trial where Mom suffered with cancer, God prospered my relationship with Him and my relationship with my family. God’s plan did not harm me because He continued to give me joy and peace even in the midst of the storm. God’s plan definitely did not harm Mom because even though she experienced physical death, I know that she is more alive and healed now than ever before with Jesus in heaven. God’s plans gave me a hope; I learned to lean on the eternal hope of heaven more than ever before during that trial. God’s plans gave me a future; because of Mom’s cancer I have more of an eternal outlook on my future and the future of others. You see, this trial was a part of God’s good plans for my family and me, which means part of God’s good plan for you might include a trial or a time of suffering. God can still prosper you, give you a hope, give you a future, and not harm you even in the midst of a storm. 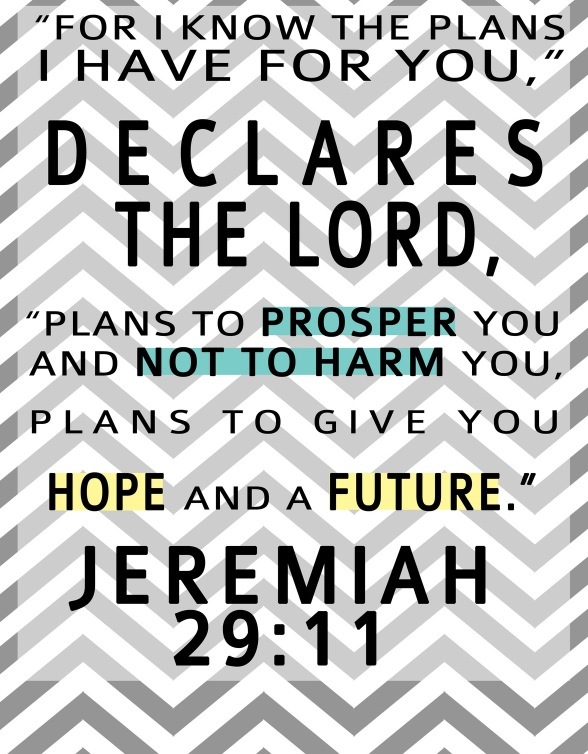 People quote Jeremiah 29:11 a lot, but often fail to look at the next two verses after it, which are equally important. Jeremiah 29:12-13 says, “‘Then you will call upon Me & come & pray to Me, & I will listen to You. You will seek Me and find Me when you seek with all your heart. '” To be honest, you cannot fully experience and know God’s good plans for you if you are not seeking Him. Seek Him by spending time in His Word, praying, worshiping, surrounding yourself with fellow Christians. Just like God says in His Word, if you seek Him, you will find Him… but you must be seeking Him. Only those seeking Christ will get to fully experience His good & perfect plans. It was 70 years before the people of Judah were delivered from captivity, but those 70 years were part of God’s good plan. No matter if your trial lasts 7 minutes or 70 years, it is still a part of God’s good plan for you, and in His timing, He will deliver you. Seek Him, worship Him, and let Jesus show you His goodness, even in the midst of your exile. Next postDoes God Answer Prayer?